OUT at Wrigley, Hair at the Hideout and more. 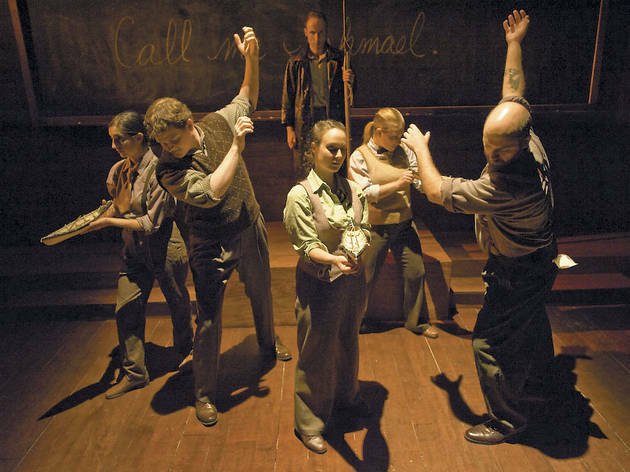 The Building Stage’s adaptation of Herman Melville’s obsessive epic features six performers taking turns as Ahab. With three drummers providing Kevin O’Donnell’s percussive live score, it’s a brilliant encapsulation of the novel’s grandeur. Theater on the Lake. 7:30pm; $17.50 (chicagoparkdistrict.com). Through Aug 5. Hold baby piglets on a tour of the Fairbury, Illinois, farm, then watch a butchering demo breaking down a whole cow, lamb or hog (yeah, the irony’s not lost on us…but it’s still awesome). 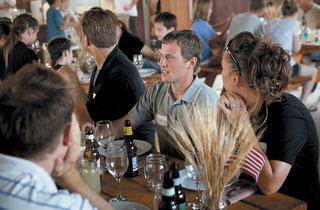 Afterward, chef Chris Pandel of the Bristol and Jason Vincent of Nightwood serve a four-course, BYOB dinner in a barn. 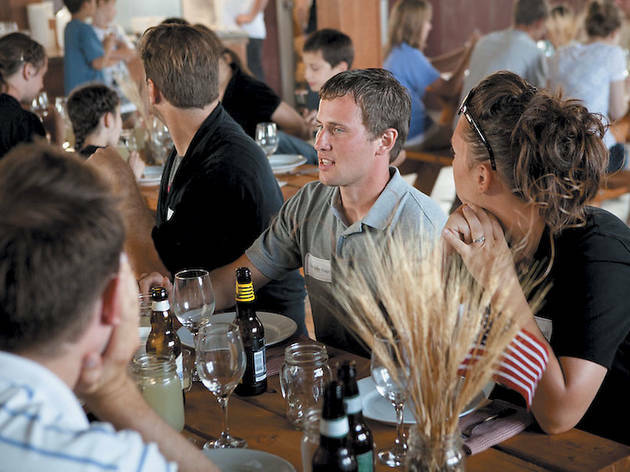 Slagel Family Farm. Noon–9pm; $125, includes bus transportation from Nightwood, 2119 S Halsted St. 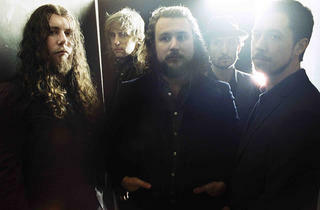 The Brit alt-rockers hit town for their Mylo Xyloto tour. United Center. 7pm; $49.50–$110. Through Aug 8. 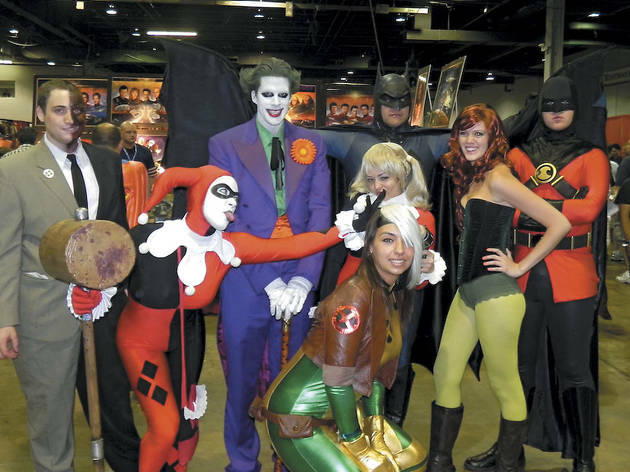 William Shatner, Stan Lee and stars from The Vampire Diaries are just a few sci-fi and comic-book celebs gracing this annual convention celebrating gaming, graphic novels, movies, TV shows and more. Donald E Stephens Convention Center, Rosemont. 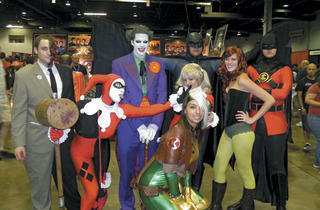 Noon–8pm; $35 (wizardworldcomiccon.com). Through Aug 12. This gloriously over-the-top fashion show/concert hybrid, hosted by Macy’s, adopts a British Invasion theme. Watch for a big-name act to perform in between runway presentations from labels such as Jean Paul Gaultier and Marc Jacobs. The after-party, taking over the entire seventh floor of Macy’s, is one of the year’s best. The Chicago Theatre. 8pm; $125–$850 (macys.com/glamorama). Last year, an army of food trucks and pop-up restaurants served street-style food to more than 400 Chicagoans; in its second year, the event expects to draw 1,000. Cooking demos, photography exhibitions, live music and a kiddie tent cap off the celebration. Zhou B Art Center. 1–7pm; $35, kids ages 6–13 $15 (streetfoodartistrychicago.com). You don’t have to dress as Elvis to run in this Fleet Feet–sponsored race, but c’mon—you’ve been looking for an excuse to bust out those blue suede running shoes. 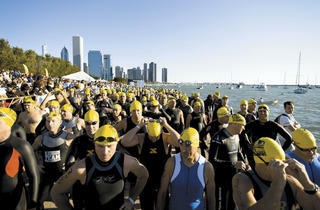 Grant Park, near Randolph St and Lake Shore Dr. 6:45pm; $30 (elvisisalive5k.com). Unroll your blanket and settle in for an all-ages astronomy lesson about phases of the moon, star clusters and more. Northerly Island. 7:15–9:30pm; free. The Annoyance Theatre reminds us it is the king of giddy, storefront filth with a silver anniversary celebration boasting live performances from current ensembles, vaunted alumni and a reunion of most of the original cast of cult favorite The Real Live Brady Bunch, which re-creates old episodes of the show. (No word yet on whether Glee’s Jane Lynch, a.k.a. Carol Brady, will attend.) Park West. 7pm; price TBD (annoyanceproductions.com). The first weekend in August, music junkies will gorge on three days of Lolla in exchange for two Benjamins and change. The dance equivalent runs for five days and is free. Auditorium Theatre, Edlis Neeson Theater at the Museum of Contemporary Art and the Pritzker Pavilion in Millennium Park. Free (chicagodancingfestival.com). Through Aug 25. 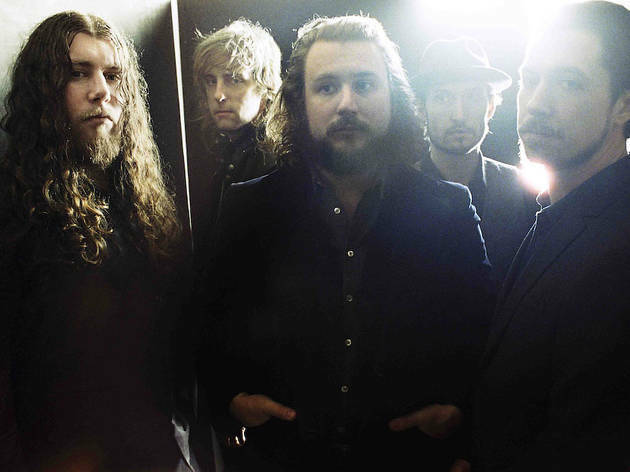 The Kentucky rockers return after a killer headlining slot at last year’s Lolla. Disciples Band of Horses bring an equal amount of echo-heavy hollerin’ and longing, if not all the cool quirks and headbanging. Millennium Park, Pritzker Pavilion. 7pm; $59.50–$64.50, lawn $20 (jamusa.com). TimeLine Theatre Company presents the Chicago premiere of this acclaimed Moises Kaufman play, about a musicologist studying Beethoven’s Diabelli Variations as she battles Lou Gehrig’s disease. Stage 773. Times TBD; $22–$42 (timelinetheatre.com). Through Oct 21. 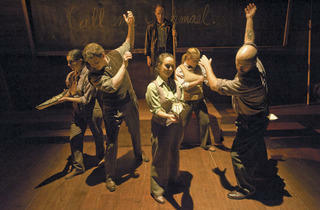 Hippies meet hipster when the Hideout stages this 1967 musical about a group of New York Bohemians fighting the draft. The Hideout. Time and price TBD (hairatthehideout.tumblr.com). Through Aug 26. Participants in this Amazing Race meets Fear Factor event may wrangle greased piglets, have snakes shoved down their shirts and navigate the Chicago River via kayak. In teams of two, decode clues to find challenges like these and more all over Chicago. $190/team (citychaseusa.com). TOC’s second annual food truck event gets bumped up to a two-day fest, with even more four-wheelers slinging food and bands booked by Empty Bottle Presents. Location TBD. Noon–10pm; $5 suggested donation (foodtrucksocialchicago.com). Through Aug 26. Hundreds of cheering gay men and women help the Cubbies kick the Colorado Rockies to the curb at this 12th annual outing and official Cubs-recognized Gay Day. Both regular and rooftop VIP seats are available, and bar events happening all summer long determine who sings the National Anthem. Wrigley Field. 1:20pm; $44–$130 (cubs.com). If more than 11,000 athletes from across the globe can put their bike-swim-run stamina on the line, surely you onlookers should have the energy to rise early to cheer them on. 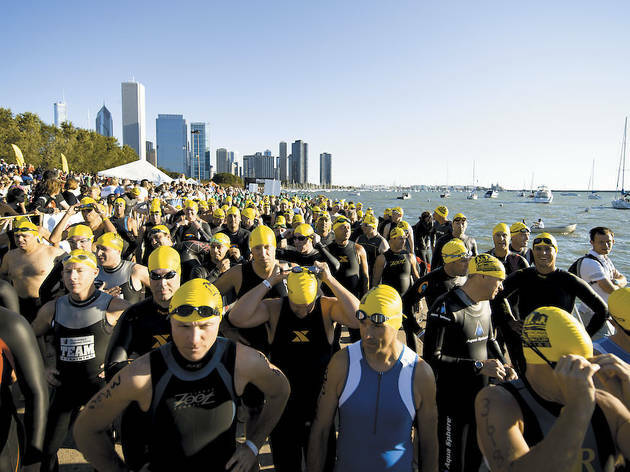 Spectators are also invited to attend the postcompetition after-party along the lakefront and the Chicago Kids Triathlon at Foster Avenue Beach on Saturday. Monroe Street Harbor. 6am; free.